You can't help but get excited about the Masters at Augusta. It is the only major to take place at the same special venue each week, which means that most golf fans have some level of familiarity of the course and the significant challenge facing the world's best golfers. Our fantasy golf game is a lot of fun - quick and simple to play, and it will make every shot important! Here's how things work. Our golf game is designed to reflect how people watch golf - everyone has a few favourite players that they follow, and pay particular attention to during the coverage. We ask you to pick four golfers for each day, and their score will determine your score. But you can't just pick the top four golfers in the world, where would the fun be if everyone had the same players? We have divided the field into four groups, which reflect their likelihood of winning the tournament - Band 1 contains the favourites, whilst Band 4 has players with an outside chance. For example, you pick Jordan Spieth and he shoots -8 on Day 1. That's 8 points for you, well played. But you have also picked Sergio Garcia who keeps finding the water and shoots a round of +3 (-3 points for you), Phil Mickelson who picks up a 2-stroke penalty and finishes on +2 (-2 points for you), and Charel Schwartzel who scores Even par (0 points). That would give you a total of 8 - 3 - 3 + 0 = 2 points. Picking winners in golf is never an easy task, but that's what makes it fun. 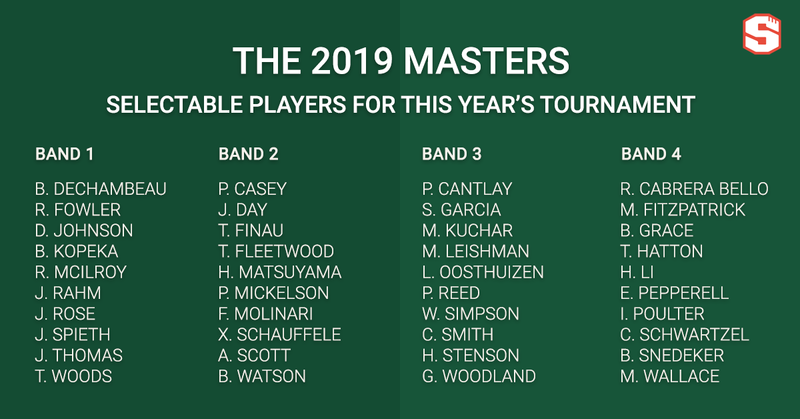 One thing about the Masters though is that rookies never win (not since 1979), so there are several names to rule out of your picks straight away. A first-time Major winner has donned the green jacket for the last four years, but I'm not sure that's any basis for making picks this week, and actually my money is on Rory McIlroy to complete the career Grand Slam by winning the only major to elude him so far. Rory McIlroy: In great form so far this season, McIlroy has his sights set on this tournament every year, and is the bookies' favourite to win. Dustin Johnson is worth considering, and often makes a fast start in the majors. Hideki Matsuyama: Matsuyama has finished in the top 20 at Augusta for the last four years, and I think he'll be in the mix over the weekend. Marc Leishman: Three top 5 finishes so far this year, Leishman looks like the standout pick in Band 3. Brandt Snedeker: Band 4 is always tricky, and given that I haven't yet picked an American, I've gone for the only one in our final group. At the end of each day's golf, it's a good idea to head back to Superbru and see how you've got on in comparison to others in your pool! After all, how you're getting on against your mates will help to determine who you select for Day 2. You can join our Masters game now by clicking the + icon in the top right corner of our app's home page and selecting 'Join a tournament'. Best of luck to all! If you fancy taking me on in this year's tournament, you can join my 'Challenge Hutch' pool by clicking here. Hi Hutch. What is weather prediction? I tend to pick players that tee off at same period of time because of weather changing during day.